· irrational beliefs as schemata. 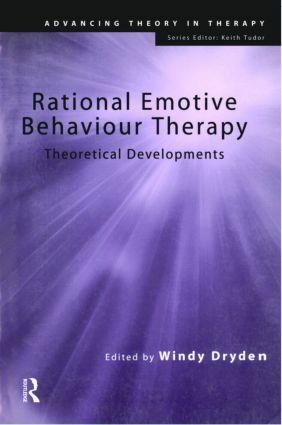 Thought-provoking presentation of case studies and the latest theory revision give Rational Emotive Behaviour Therapy: Theoretical Developments a distinctive slant: a challenging discussion of the approach's openness to revision from within and outside the ranks of REBT, and its implications for the future. Series Preface. Dryden, "The Cream Cake Made Me Eat it": An Introduction to the ABC Theory of REBT. Ellis, Differentiating Preferential from Exaggerated and Musturbatory Beliefs in Rational Emotive Behaviour Therapy. Robb, REBT: Thinking it Through Once More. Backx, REBT as an Intentional Therapy. Nielsen, How Deep Can We Go? How Deep Should We Go? Irrational Beliefs as Schemata. McMahon, Notes on Self and Values in REBT. David, Rational Emotive Behaviour Therapy (REBT): The View of a Cognitive Psychologist. Doyle, The Contribution of Social Psychology to Rational Emotive Behaviour Theory. S. P. Kodish, B. I. Kodish, Contributions of General Semantics to REBT Theory: Evolutionary Psychology and Rational Emotive Behaviour Therapy. Pelusi, Theoretical Developments in REBT as Applied to Schizophrenia.